I'm in the midst of my cookie baking. These are an old family tradition - tasty and chocolatey! AND they are really easy and quick to make - so I can bake up a batch or two in a flash. Preheat oven to 350 degrees. Melt chocolate and butter in double boiler over hot water. Stir. Cool. In large mixing bowl, beat eggs until foamy, then add sugar, 2 tablespoons at a time, beating until thickened (5 minutes in electric mixer). Blend in chocolate. Add flour, baking powder, salt and cinnamon; blend. Stir in vanilla and nuts. Grease cookie sheet. Drop teaspoonfuls of batter onto cookie sheet. Bake until cookies feel 'set' when very lightly touched - 8 to 10 minutes. Looking for new or classic cookie recipes? 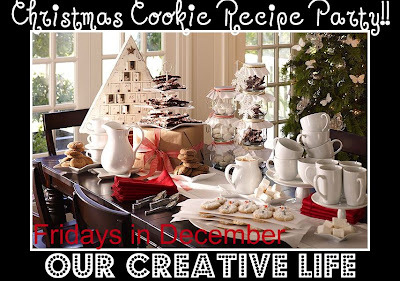 Check out the "Christmas Cookie Recipe Party" every Friday over at "Our Creative Life" - and share your recipes too! these look yummy! my son loves chocolate cookies. thanks for sharing your recipe. Those look scrumptious! Sorry it's taken me so long to stop by...I've been sick. Don't forget tomorrow is the last day of the Christmas Cookie Recipe Party..so come on by!